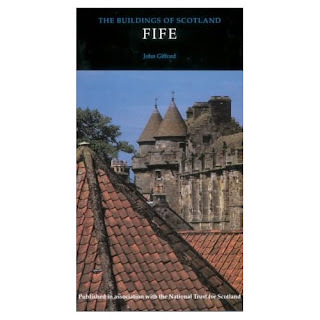 Fife's most famous buildings include Dunfermline Abbey, with its sturdy Norman nave; St Andrews cathedral, the focus of the old University town on the North Sea coast; the foursquare post-Reformation kirk at Burntisland; the palace of Falkland, where James V became Britain's first patron of Renaissance architecture on the grand scale; and the little royal burghs along the coastal fringe, each with its harbour and its strings of vernacular houses presided over by the kirk and tollbooth. Cupar, at the centre of Fife's long peninsula, is the seat of local government and one of the most charming and prosperous of Scottish towns. Less well known are Fife's tower houses like Scotstarvit, the old seaboard castles of St Andrews and Ravenscraig, the picturesque Balgonie Castle and the thoroughly domesticated Kellie Castle. Of Fife's churches one of the most beautiful is Dairsie; and three centuries of inventive design in burial monuments come to an unexpected climax in a work by Charles Rennie Mackintosh in the MacDuff cemetery, East Wemyss.